For other uses, see Shepherd's Bush station (disambiguation). Shepherd's Bush Market is a London Underground station in the district of Shepherd's Bush in west London, England. It is on the Circle and Hammersmith & City Lines, between Goldhawk Road and Wood Lane stations, and it is in Travelcard Zone 2. Shepherd's Bush Market, from which the station takes its name, is an open-air market which runs parallel to the railway line. The Metropolitan Railway (MR) opened the original station on 13 June 1864 as Shepherd's Bush on its new extension to Hammersmith. It was in the Shepherd's Bush Market area just south of Uxbridge Road. From 1 October 1877 until 31 December 1906 the MR also ran direct services along this line to Richmond via Hammersmith (Grove Road). The original Shepherd's Bush station closed in 1914 to be replaced by two new stations which opened on 1 April 1914: the new Shepherd's Bush station resited a short distance north across the Uxbridge Road, and Goldhawk Road about half a kilometre to the south. Those stations remain in those locations but nothing exists of the former station buildings in the marketplace. In 1900 the Central London Railway (CLR) opened its Shepherd's Bush station, now the Central line station, at the other end of Shepherd's Bush Green. For 108 years there were two Tube stations of the same name 0.3 miles (480 m) apart. In 2008 the new London Overground Shepherd's Bush railway station was opened on the West London Line. To avoid the confusion of three stations named Shepherd's Bush, the Hammersmith & City line station was renamed Shepherd's Bush Market on 12 October 2008. 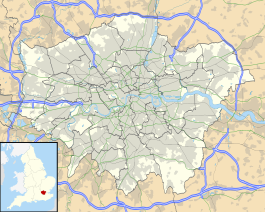 The other two on the Central line and the West London line are close to each other and interchange is allowed, but not with Shepherd's Bush Market tube station. The station is at the western end of Shepherd's Bush Green, and stands just across the road from the marketplace which gives it its name. Stallholders have traded on the strip of land beside the Hammersmith & City line since 1914, when the market took over the station's first site. The other end of the market is served by Goldhawk Road Underground station. Shepherd's Bush Market station is the nearest Underground stop to various entertainment venues including the Bush Theatre and the Shepherd's Bush Empire. It is also one of the Underground stations which serve Loftus Road Football Stadium, the home of Queens Park Rangers football club. Westfield and West12 shopping centres are near the station. London Buses routes 207, 260, 283 and 607 and night route N207 serve the station. ^ Sheppard, Francis Henry Wollaston (1971). London, 1808-1870: the infernal wen. University of California Press. p. 141. ISBN 978-0-520-01847-1. ^ a b Rose, Douglas (1999). The London Underground: a Diagrammatic History (7th ed.). Capital Transport Publishing. ISBN 1-85414-219-4. ^ Panton, Kenneth (2003). "Shepherd's Bush". London: a Historical Companion. Tempus Publishing. ISBN 0-7524-2577-3. Wikimedia Commons has media related to Shepherd's Bush Market tube station. 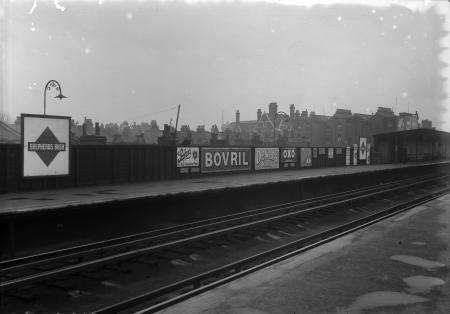 Shepherd's Bush station platform, 1934, note Metropolitan line style diamond "roundel". "Shepherd's Bush and White City development". Always Touch Out. Archived from the original on 13 July 2004.